Welcome to ExamNotes by CertBlaster! In this edition we will examine the Cloud and the wealth of services available in it. A quick caution when you are examining services, there is a tendency in the sales community to use Cloud terminology buzzwords to describe traditional services to make them sound updated. You will not find that here or on the test but you may encounter it in life or business. Now we will look at the Cloud categories of service as defined by the National Institute of Standards and Technology (NIST). Then the types of service and some of the methods used to make hardware, applications, databases, and even operating systems run online. Cloud services are hosted and managed by third party entities that provide most of the hardware and software used to access their services on demand. The services need to be broadly accessible and provide resource pooling. The storage needs to provide rapid elasticity and be capable of measured service. There are several service models used to describe how much service the provider is responsible for and how much falls to the customer. If you think of Cloud service categories as a stack of service models with the lowest layers providing the foundation of total vendor management responsibility. Here is an example. SaaS stands for Software as a Service. In this case the vendor supplies and manages everything from the hardware to the applications to be used. This is a total solution and users and developers alike can access and modify the content where applicable. Different Cloud computing types offer different levels of accessibility as you will see next. IaaS stands for Infrastructure as a Service. IaaS would be at the foundation in terms of vendor responsibility. The vendor supplies virtual access to the hardware, including virtual servers that can run the customers server software and applications they own on demand. Also this configuration can be used to host websites and email servers. As the name implies the vendor supplies the Infrastructure and the customer supplies the applications and data. Depending on the agreement the vendor may or may not supply the operating system(s). PaaS stands for Platform as a Service. It is quite similar to IaaS but provides two additional value added services making it the second layer of Service. For example providing a platform for collaborative software development that maximizes the workflow regardless of the data source of an application, meaning dissimilar sources can be used. Secondly the platform allows for proprietary application data to be used in the creation of software. This is useful supporting multiple developers and automating the testing process. 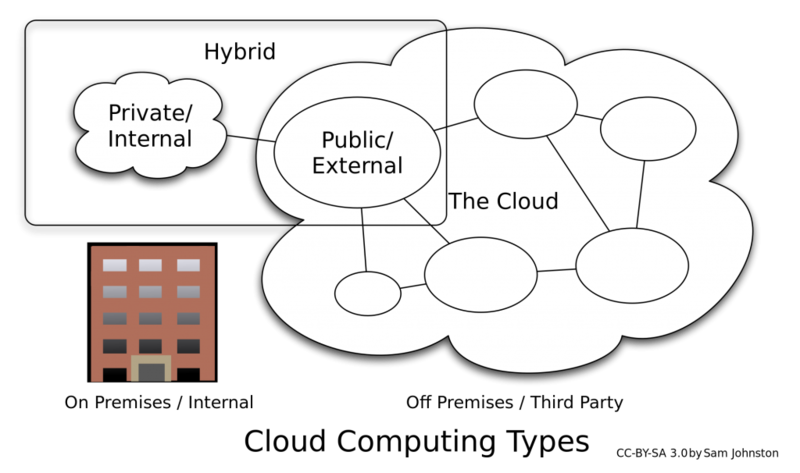 The Public Cloud is just that, available to all parties over the Internet. There are numerous companies providing publically accessible services like email or storage. A Private Cloud is internal to a company or organization and provides access only to those on the premises or VPN. Private Clouds are the most secure type. A Hybrid Cloud is a combination of public and/or private Cloud networks. These are often offered by hosting providers along with dedicated hosting. A company may use the private internal Cloud for storage and confidential communication and the external Cloud for email and web services. A Community Cloud is used by a collaborative group that shares the resources for a common goal. This could be a medical group, insurance companies or any group of entities that has a shared objective. These types tend to be bigger than Private Clouds and smaller than the Public Cloud. Here is a graphic representation of the main Cloud computing types. To qualify as a Cloud compatible service the Infrastructure, Platform and Software must meet the NIST guidelines listed below. You can provide or receive more services but these are the minimums. Rapid Elasticity is the ability of a Cloud solution to scale its service level to the demand. This can take the form of adding storage space or user capacity seamlessly without interruption or the need to physically change hardware. On-demand is service that is available at any time. The redundancy that is available to Cloud based solutions makes 100% availability (uptime) a reality. Resource pooling allows providers to spread the available resources across multiple consumers or companies by sharing them. The resources are scaled dynamically and imperceptibly to each user as needed. This provides the maximum utilization of resources while providing the expected levels of service. Measured service is the practice of analyzing or metering the amount of resources used by an individual or organization to measure the usage of those resources for billing or capping instances of over the limit consumption. This covers quantifying elements like bandwidth, storage, or other services. That’s all for 220-902 Objective 2.3. Good Luck on the test!